Winter sports are highlighted by the basketball, hockey, and wrestling teams, or as people may call them, the main sports. Another sport is being taken up by the kids of Rockland High recently though, and it is swimming. The swim team won a league title in 2014-2015, and since then many students have seen the swim team as a great activity to take up. Cornell McWilliams has been swimming since his sophomore year for the team. He seems to be the fun and outgoing kid on the team. Everyone has different ways of preparing for a sport. McWilliams takes the light and mellow approach to preparing, until his race is about to start, then it all turns serious for the swimmer. Swimming is different from the other winter sports. The kids have to go into a cold pool in the dead of winter. The effect of the time of year on this sport is definitely a question for some people. However, it doesn’t affect the team that much as the kids are still showing up. “It’s not tough hopping in the pool ‘cause the building’s warm and all that, but getting out at the end of the day and leaving is a nightmare,” said McWilliams. Every sport has a player who is referred to as what people call an unsung hero. The swim team has a girl and boy to represent their unsung hero.The two unsung heroes were picked by Mrs. Margolis. For the boys, the player who received the honor was Jacob Harris who “has a close to perfect attendance record and has taken on some of the most difficult races you can do, the 200 IM and the 500 Free and keeps on smiling all of the time,” said the coach. The girls’ swim unsung hero is Angelina Vuong who is the only student with perfect attendance this year. “She tackles the 100 fly and whatever else I throw her way every time without complaint,” explained Mrs. Margolis. It sounds like the kids have had fun and learning experiences in the sport. 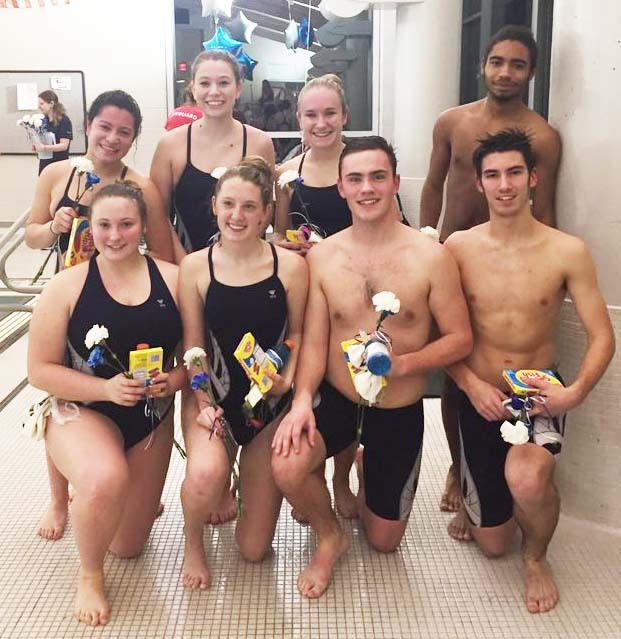 They closed out their season at the South Shore League Meet in Middleboro on February 4.